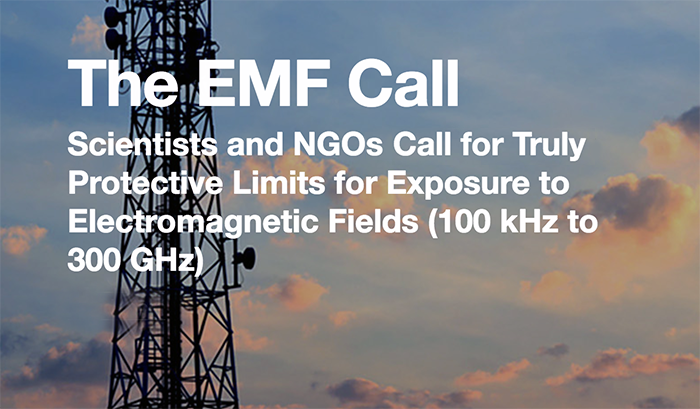 On November 1st, 2018, in order to protect the public and the environment from the known harmful effects from electromagnetic fields (EMF), The EMF Call was launched. It is by November 26, 2018, signed by 164 scientists and medical doctors together with 95 non-governmental organizations. New medical guidelines need to be developed that represent the state of medical science and are truly protective. They also need to be developed without any industry influence. The EMF Call also urges all governments, the UN and the WHO not to accept the ICNIRP guidelines, issued as draft on 11th July 2018. ICNIRP’s guidelines pose a serious risk to human health and the environment. They allow harmful exposure to the world population, including the most vulnerable. They are not protective. They do not represent an objective evaluation of the available science on effects from this form of radiation. If you are a scientist, medical doctor or represent an NGO, and also want to support The EMF Call, you are welcome to contact us.